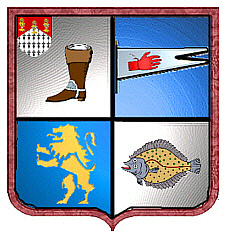 Coat of Arms: Quarterly: 1st: silver, with a canton divided per chevron red and ermine with three gold covered cups, and a boot, 2nd: blue, a silver flag with a red hand, 3rd: blue, a gold lion, 4th: silver, a fish. Crest: An arm in red holding a dagger. Arms: Gu. three lions pass. in pale or. each holding betw. the forepaws an esquire's helmet ppr. 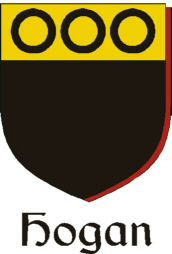 Crest: A dexter arm in armour embowed, the hand grasping a sword. Spelling variations include: Hagan, Hegan, Hagen, O'Hagan, Heggan, Heggen, Hogan. First found in county Tyrone where they held a family seat from ancient times. Some of the first settlers of this name or some of its variants were: Agnes Hagan settled in New England in 1802; Alexander, Bernard, Charles, Henry, James, John, Michael, Patrick, Thomas and William Hagan all arrived in Philadelphia between 1840 and 1860. Crest: A dexter arm in armour embowed, the hand grasping a sword all ppr. Cosgrach, brother of Cineidh [kenneth or kenneda] who is No. 104 on the "O'Brien" pedigree, was the ancestor of O'h-Ogain, of Munster; anglicised O'Hogan, Hogan, Ogan, and Ougan. "I come from a Christian background Baptist to be specific. For the past seven years I have been fascinated with the similarity of my family name HEGGAN to that of HAGGI. Probably because my Jewish friends call me HAGGEE. There is an interesting similarity in the ending YOD in Haggi and the ending Nun sofiet in Heggan. However, in the JPS TANAKH both 1917 and 1986 at 2nd Kings 9:27 the Hebrew words "house of the garden" (Rendered that way in KJV, NASB and other Christian versions) are rendered as city names "Beit Hagan and Beth-haggan" respectively. According to the Israel Tourism Ministry Beit Haggan is the modern day city of Jennin. In Hebrew the "Ha" and "He" sounds are the same meaning "the". With Haggan meaning "the garden". My Great Grand Father William Heggan was born in Ireland in 1843 and emigrated to the USA in 1880's. I checked a couple Irish genealogy sites with name references. They indicated that Heggan is actually Hagan, or O'Hagan which is derived from root name Agan or Akan. A study of Phonetics shows that all vowels are preceded by an "aspiration" or "H" sound. Therefore, the name Agan or Akan is pronounced "H"agan or "H"akan. These site also indicated that Hagan was a very ancient Irish name, which could indicate that it goes back to Israelite origins. I don't know if this is the type of information you are seeking, but I have presented my family name as I have researched it. If you have any questions please contact me." 104. Cosgrach: son of Lorcan: a quo Cosgrave, of Munster. 106. Ogan ("ogan:" Irish, a youth): his son; a quo O'h-Ogain. 109. Teige (2): his son. 110. Giolla Padraic: his son. 113. Edmond (2): his son. 114. Edmond (3): his son. 116. Conogher: his son; who died A.D. 1635. 117. Conogher (2), alias Giallgarbh [gilgariv], O'Hogan, of Cranagh, county Tipperary: his son; a quo Kilgarriff. This Giallgarbh had a brother named Dermod; living in 1657. 'Irish Pedigrees' by O'Hart, Volume 1, Page 96, dated 1892, reprinted 1989.